Last week a few labourers were working in my yard with shovels. With barely visible radials of my 80 meter tower vertical lurking in the grass and weeds the inevitable happened. I was lucky that only one radial was severed. I watched from some distance away while talking with the supervisor and several others with no opportunity to politely intervene. I knew it had happened when the young man with the shovel looked down with a puzzled look on his face. Perhaps I should have rolled up the radials after all. No matter, the deed was done and I was left to deal with the consequences. But were there consequences? In fact I was not particularly bothered by the radial damage even though CQ WPX CW was days away. Neither was I concerned about replacement cost since wire is cheap and the radials are only 8 meters long. I went ahead and used the antenna to make a dozen 80 meter contacts in the contest without a qualm. If its performance changed I couldn't tell. It is worth taking a few moments to delve a little into what is going on here, and to thus explain my lack of concern. Radials are often misunderstood by many hams. Let's start with the most easily measured data: impedance and SWR. The model view of the disfigured antenna is at right. Wire 24 was chosen to represent the radial damage since it is parallel to an axis, making it easy to change its length, and orthogonal to the 40 meter inverted vee, just like the damaged radial. Modelled SWR curves show the effects. Resonance drifted upward by about 25 kHz (~0.5%). I see greater variation than this when it is raining or snowing, and the ground is thawed or frozen. That is, the change is negligible. The increased ground loss is similarly small, being well under -0.1 db in the model. With my antenna analyzer I swept the SWR from 3.5 to 3.8 MHz and confirmed that there is no discernible change. I have no means to measure ground loss, other than noting that performance seemed no worse than before; the antenna performance remains poor though servicable. Returning to the model I calculated the radial currents. As expected the current in the short radial is so small as to be equivalent to the radial being absent. I could just as well have titled this article 7 Radials. Current in the two adjacent radials was reduced less than 10%. Current in the other 5 radials was equal and of the expected magnitude; that is, they are unaffected by the cut radial. What can we take away from the radial-cutting incident and my analysis? The points to be made are modest but I believe important in better understanding radial behaviour. With 8 short radials adding or subtracting 1 radial has a small but measurable effect on antenna resonance. That is, the radials are still acting in part as resonant counterpoises. The effect diminishes with increasing radial counts. 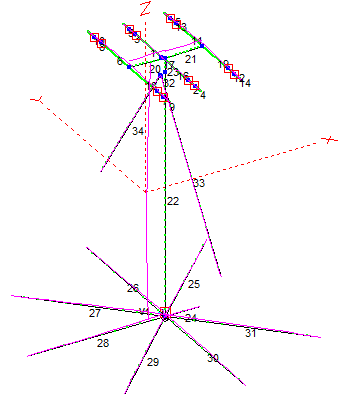 With a large number of radials the radial system is more ground plane than counterpoise. The loss of one radial increases ground loss only a small amount. Again, the effect declines with increasing radial count. One aspect I did not attempt to isolate was the degree to which the increased ground loss, which is in series with the radiation resistance, affected the frequency of minimum SWR versus frequency of X = 0 Ω. The two frequencies are typically not the same. With 8 radials the loss of symmetry -- equal length and spacing -- due to one deleted radial is small, even with the short 0.1λ radials I am using. A similar loss with 4 radials is more dire. Adding or subtracting one radial is no big deal for other than the most minimalist radial system, whether on the ground or above ground. It is not surprising that studies of radials and actual antenna construction typically discuss performance changes when the radial count is doubled or halved. Large changes in radial count are what make a measurable difference. For example, if you want to improve the efficiency of your vertical double the radial count. Don't settle for lesser increments. Doing it this way also happens to be the most convenient since you are laying one radial centred between every two existing ones. Nothing needs to be moved. But you'll want to stock up on low-cost wire since doubling radials requires a lot of wire.